Junkyard Life: Classic Cars, Muscle Cars, Barn finds, Hot rods and part news: Hot Rod Power Tour 2013 tries to kill Junkyard Life guys! Hot Rod Power Tour 2013 tries to kill Junkyard Life guys! Hot Rod Power Tour highlights. Finally! 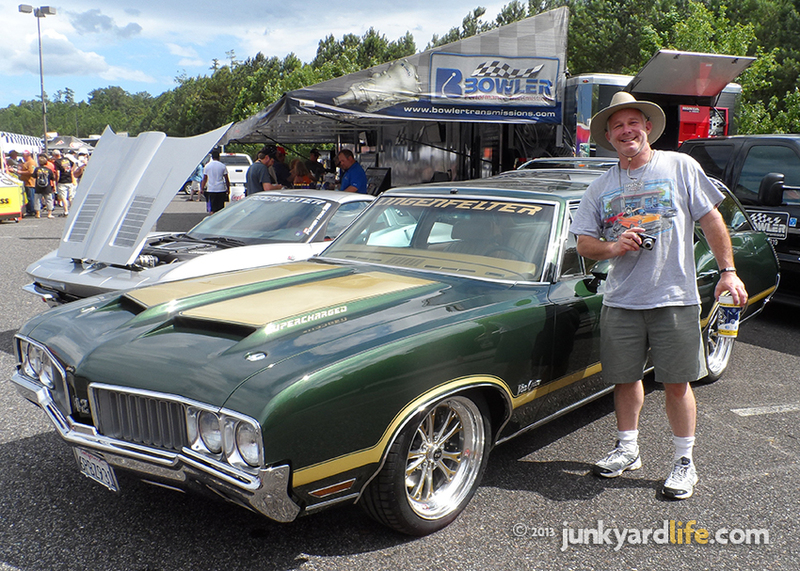 Someone appreciates a green Vista Cruiser Wagon! This one may outrun mine though. It was Hot Rod overload. Oh, it tried. 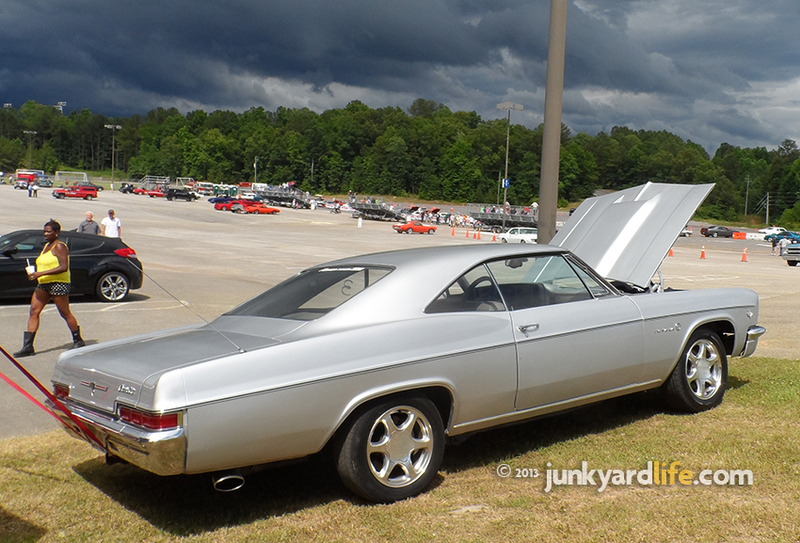 With thousands of cool rods landing at the Birmingham stop of the Hot Rod Power Tour, automotive attention deficit disorder guys, like us, didn’t stand a chance. But we fought back with a good pair of shoes, a big floppy hat and a camera. There is no way that we could begin to cover all the cars we loved there. So, on to the highlights. 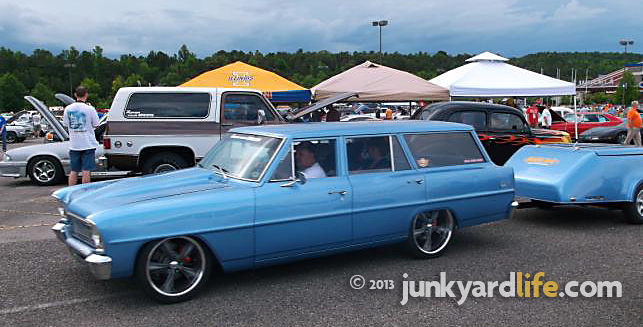 Keith Lively's tricked-out 1966 Chevy Impala was transformed into a luxury beast via an AWD 2004 GMC Denali. The LS engine and rear a/c make this one cool ride. The absolute highlight of the entire week was my invitation to ride along with, fellow Junkyard Life brother, Keith Lively, in his innovative 1966 Impala on the autocross. Lively, a Birmingham-native, built the unassuming family car. It looks like a ’66 Impala, but has the guts of a 6.0 liter LS engine, all-wheel drive 2004 GMC Denali. Thanks, Keith! That was awesome! Check out the video here. 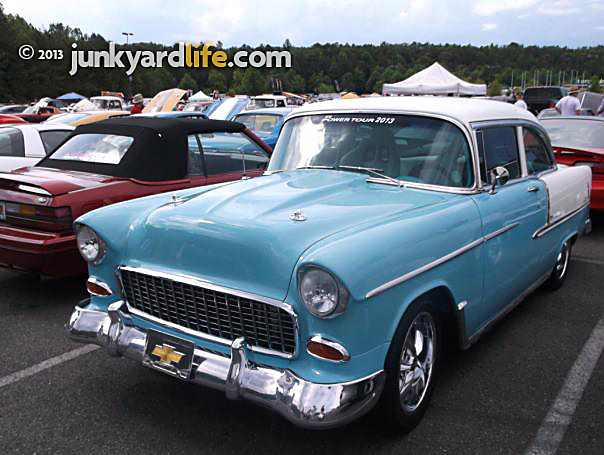 1955 Chevys caught my eye all over the HRPT. Since we are building a Tri-Five at this very minute, I had to take plenty of pictures of them. You know, for research purposes. You may also notice I prefer the sedans over the hardtops. I know, hardtops are worth more. I just like the post cars. 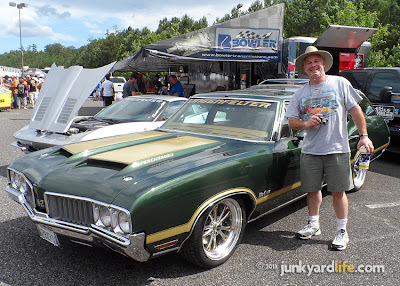 Tell us about your Hot Rod Power Tour experience! Send emails to Ron at Kidd403@bellsouth.net or Jody at junkyardbull@gmail.com. 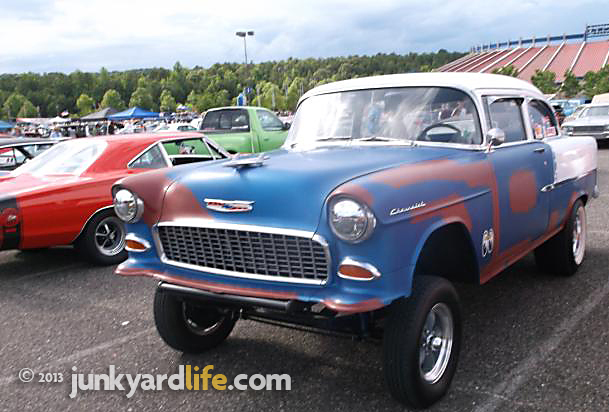 Check out this double nickel Chevy gasser. Jody and I found a way to combine our love for Tri-Five Chevy’s and wagons. 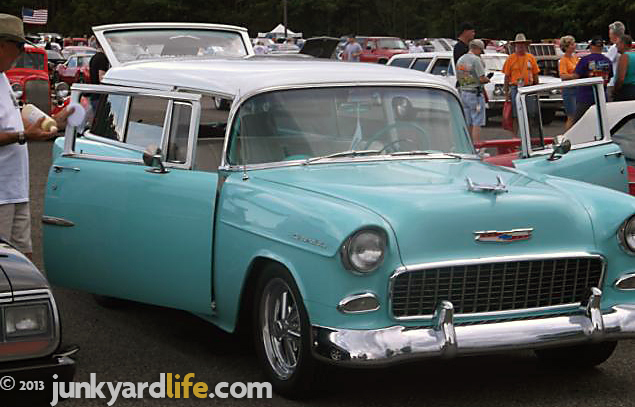 We remember a ’55 Nomad in a barn that begs for a trip on the HRPT. 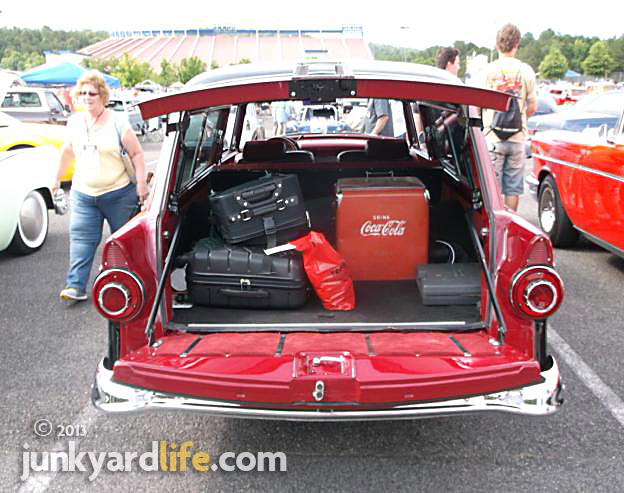 Wagons prove to be popular, handy and way cool on Power Tour. 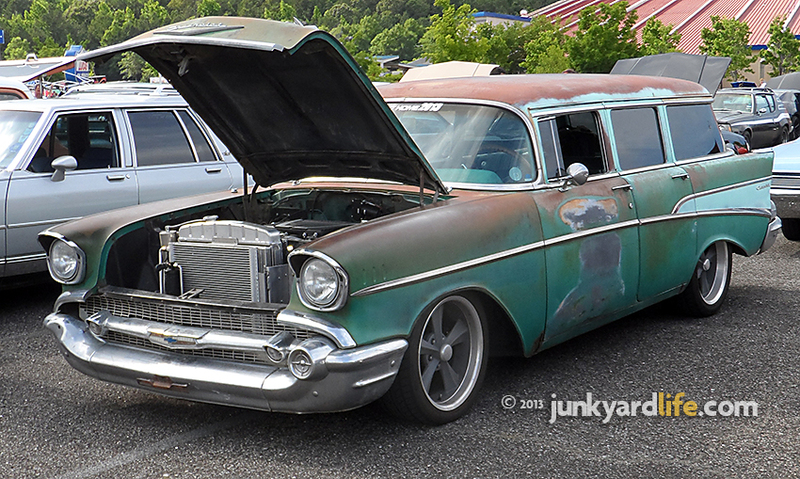 This ’57 Chevy 210 was packing patina. 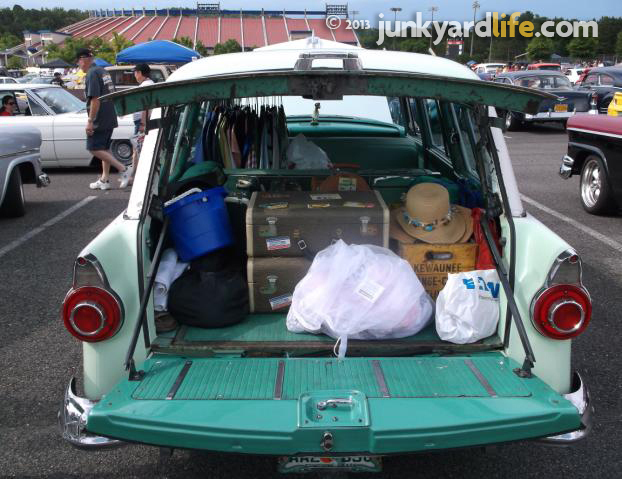 These 1955 Ford Ranch Wagons were Long Haulers, boasting vintage luggage and the same retro cooler that I have in my Vista Cruiser wagon! Proven fact: A vintage ice chest gives your car 10 extra horsepower. 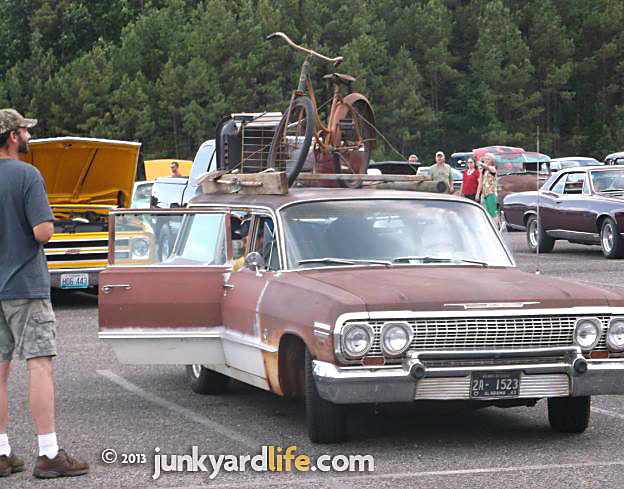 This 1963 Impala wagon carried a bicycle on the roof rack with a one-of-a-kind matching paint job. Let's call it rust. What would Ron do now in this dilema? I have no idea. 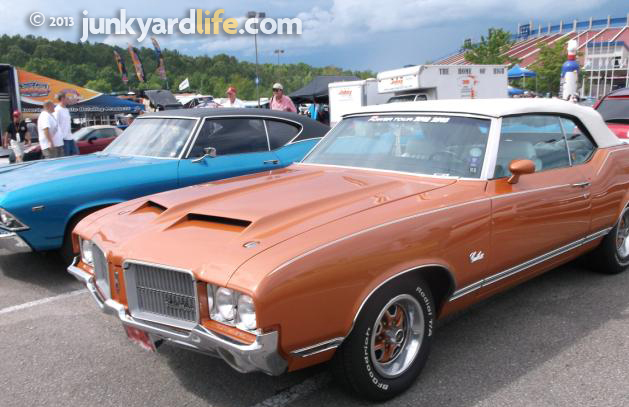 Two dream cars, a 1971 Cutlass and a 1971 Buick Grand Sport, both my favorite GM colors other than green. Help! 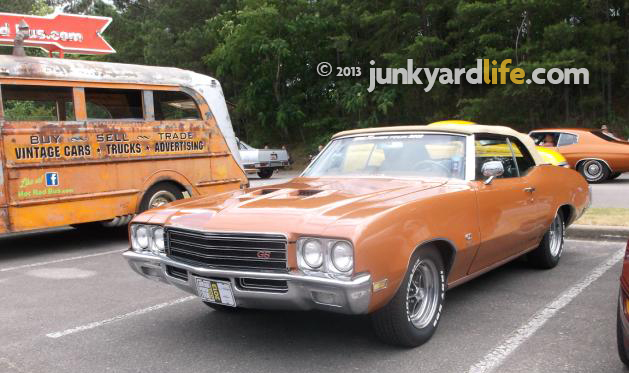 A 1971 Buick GS convertible in Bittersweet Mist. 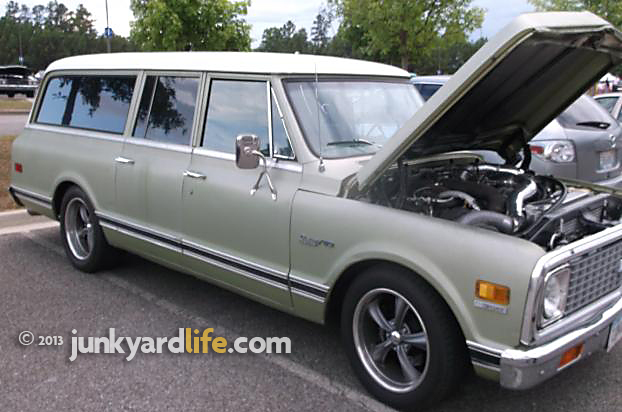 This early seventies Suburban barely caught our eye until we saw under the hood (photo below). Good night alive! I can only imagine the torque and horsepower figures this twin turbo LS was making. Hats off. 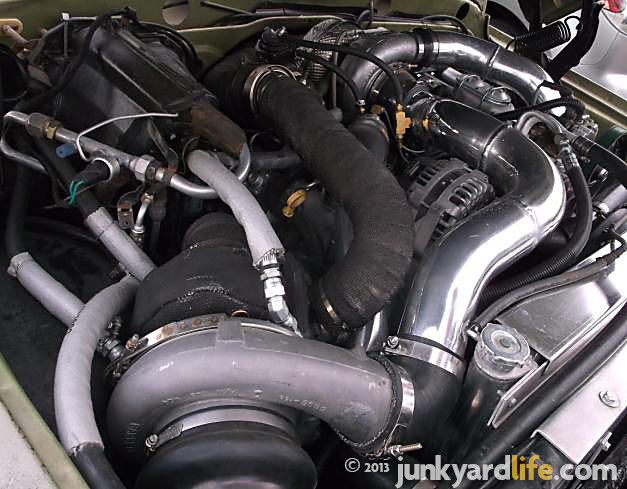 Twin turbo LS engine in a 1972 Chevy Suburban. Not a strong showing of our Colonnade kiddies from 1973-1977. 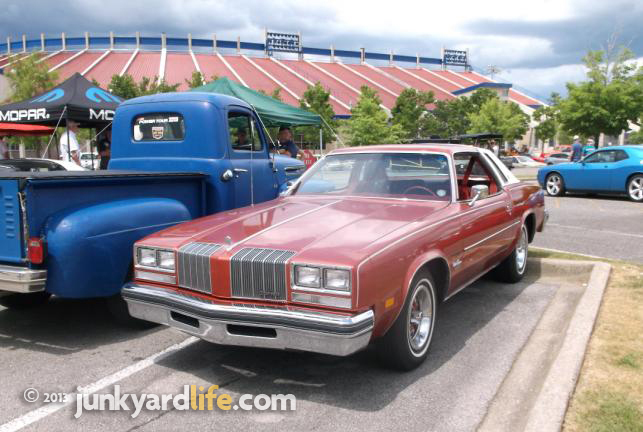 Here is a 1973 Pontiac Grand Am in red, white and blue. 1977 Cutlass Supreme reminding us of Nanny Dean. Where are the Grand Prixs in between? Buick GNX clone or the real deal? 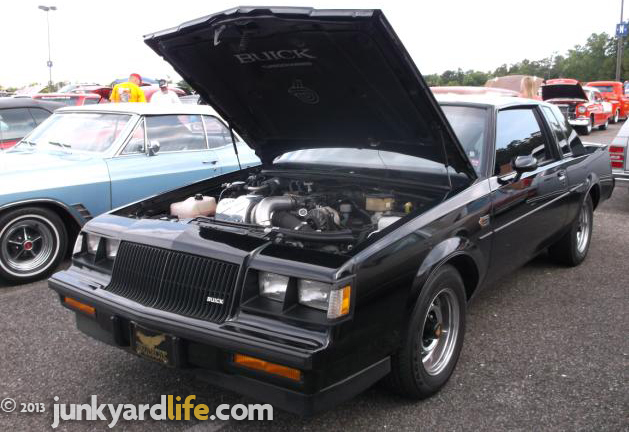 A Buick GNX was the ultimate street fighter of the late 1980s. I am a T-Type guy myself. Check out this two-tone Turbo! 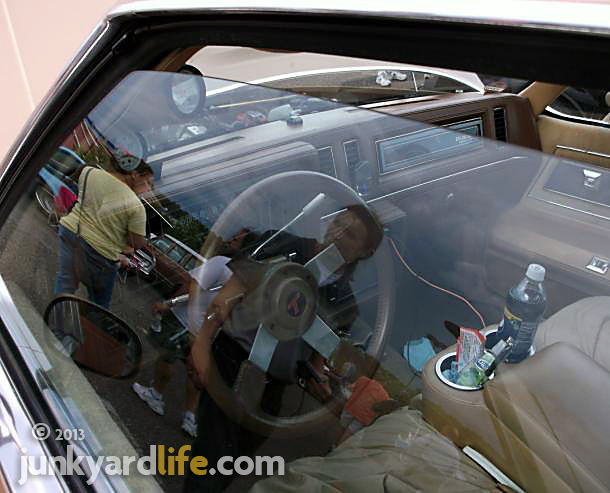 Check out this super imposed photography of the ghost of Jody Potter in the turbo Buick! I noticed the bench seat and the column shifter before I noticed him. Hey, Jody! Get your ghost out of my T-Type with a bench seat and a sneaky column shifter! 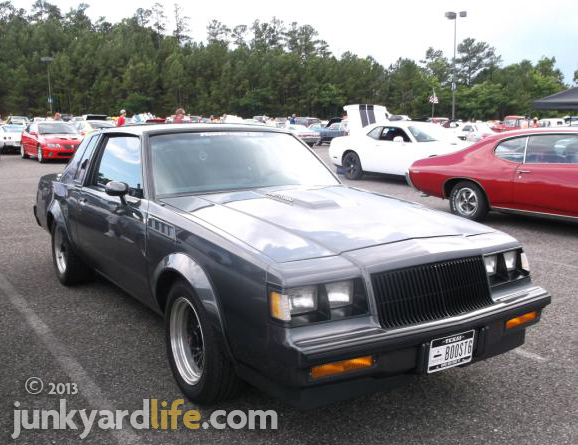 A 1987 Buick Grand National is on my turbo dream list. Hot Rod Power Tour Long Haulers loaded up and left Birmingham for their next stop in Chattanooga.